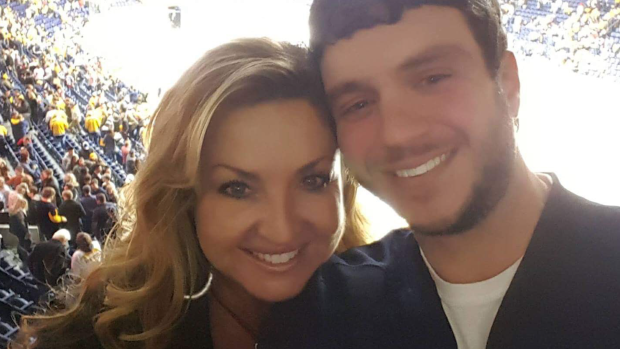 "I have no idea who I operated on," said Dr. Jay Coates, a trauma surgeon whose hospital took in many of the wounded after a gunman opened fire from his 32nd-floor hotel suite Sunday night on a country music concert below. "They were coming in so fast, we were taking care of bodies. We were just trying to keep people from dying." 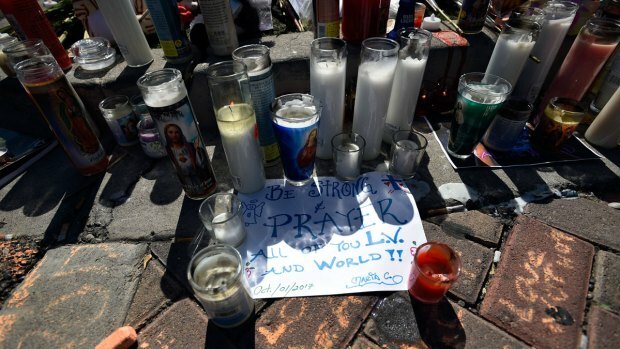 It was the deadliest mass shooting in modern U.S. history, with at least 58 killed and 527 injured, some by gunfire, some during the chaotic escape. Scores remained in critical condition Tuesday. At least 59 people were killed and more than 500 injured when a man opened fire at an open-air concert in Las Vegas from a nearby hotel. 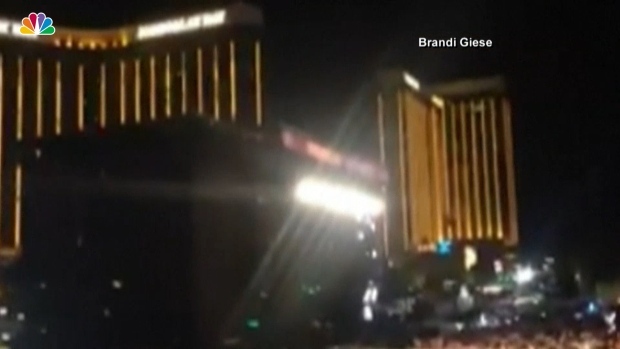 Authorities say the gunman set up cameras inside and outside the hotel room where he opened fire on the crowd at a country music concert. Sheriff Joe Lombardo said at a news conference Tuesday that he believes Stephen Paddock set up the cameras to see if anyone was coming to take him into custody. He did not release further details. The sheriff also said authorities had completed their investigation at the gunman's property in Reno, finding five handguns, two shotguns and a plethora of ammunition. University Medical Center of Southern Nevada was one of many hospitals that were overflowing Tuesday. "Every bed was full," Coates said. "We had people in the hallways, people outside and more people coming in." 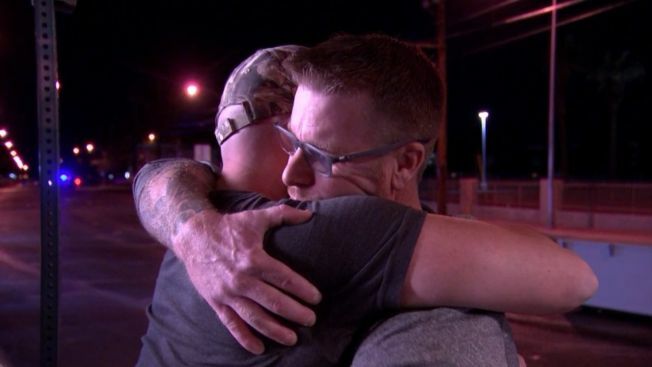 After the mass shooting at a country music concert that left scores dead and hundreds injured in Las Vegas, stories of heroism have come to light. "It was very clear that the first patient I took back and operated on that this was a high-powered weapon," Coates said. "This wasn't a normal street weapon. This was something that did a lot of damage when it entered the body cavity." He had 23 guns — some with scopes — in the room where he had been staying since Thursday. He knocked out two windows to create sniper's perches he used to rain rapid fire down on the crowd of 22,000 people some 500 yards away. He also had two "bump stocks" that can be used to modify weapons to fire continuously, as if fully automatic, according to two U.S. officials briefed by law enforcement who spoke on condition of anonymity because the investigation is still unfolding. At Paddock's home, authorities found 19 more guns, explosives and thousands of rounds of ammunition. Also, several pounds of ammonium nitrate, a fertilizer that can be turned into explosives, were in his car, authorities said. The FBI discounted the possibility of international terrorism, even after the Islamic State claimed responsibility for the attack. But beyond that, the motive remained a mystery, with Sheriff Joseph Lombardo saying: "I can't get into the mind of a psychopath at this point." 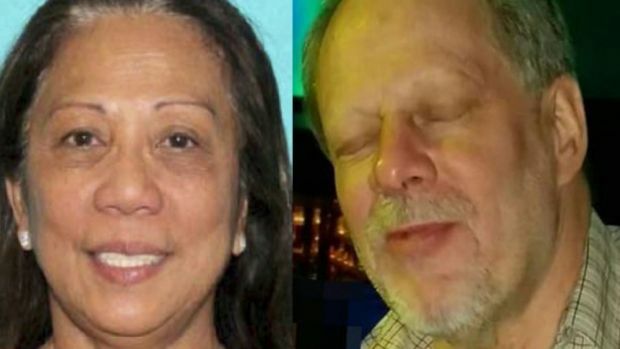 While Paddock appeared to have no criminal history, his father was a bank robber who was on the FBI's most-wanted list in the 1960s. 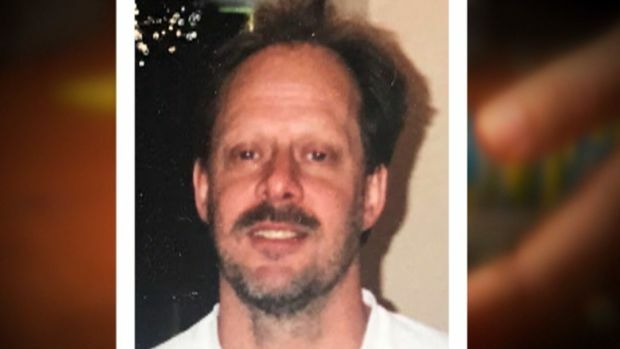 "I can't even make something up," his brother in Florida, Eric Paddock, said when asked what might have motivated his brother. "There's just nothing." President Donald Trump on Tuesday called the gunman "demented" and a "very, very sick individual." Asked about gun laws, the president said, "We'll be talking about gun laws as time goes on." "We can't worry about the victims," an officer said over the radio at 10:15 p.m. "We need to stop the shooter before we have more victims. Anybody have eyes on him ... stop the shooter." "It was chaos — people just running for their lives. People trying to get down. Trying to get to their loved ones that had gotten hit," Shaun Topper said. "We had no other option," she said. Tales of heroism and compassion emerged: One man grasped the hand of a dying stranger, unable to pull himself away despite the danger. Another borrowed a flannel shirt from a man he didn't know to create a tourniquet for a girl he didn't know. Authorities put out a call for blood donations and set up a hotline to report missing people and speed the identification of the dead and wounded. They also opened a "family reunification center" for people to find loved ones.